At the last day of 2013, I decided to look back at 2013 and write down how I experienced it. First, I determine if my predictions of 2013 came out or not. I expected the year 2013 to be really crazy after Microsoft’s 2012 Christmas Gift: System Center 2012 SP1. I have to admit, it didn’t become ridiculously crazy as I expected. Despite all efforts to introduce customers with the cloud, many organizations are not completely ready for it politically. From a technology perspective, I didn’t really expanded much at all. My projects and my focus stayed a lot with Configuration Manager, only the stuff related to ConfigMgr were introduced to me, Windows Intune is a good example of this. In a few of my previous posts, I was attempting to automate a ConfigMgr 2012 Site Deployment. One of the biggest challenges was preparing an answer file for an unattended setup because the .ini file needed is very, very static. One of the biggest challenges was dynamically adding hostnames for site server and sql server. I’ve decided to explore the world of PowerShell to see if I was able to create a script that will generate the answer file for me and populate it with the buildup ConfigMgr requires. Now that I know which lines are in the answer file, I can continue. To me, the world of PowerShell is still pretty new, but I’m starting to familiarize myself more and more with it. I have to admit it’s great stuff to work with. Some things are still very static, for example site code and some locations. You can always modify them to your needs before you run the script. You may notice that I created a separate variable for the Site Server and SQL Server in case the SQL runtime is running on a different machine. I added some empty lines to maintain the same buildup. Keep in mind though, this will only generate an answer file at a given location. After running this script you should be able to run an unattended install of ConfigMgr 2012. Feel free to use this script. If the script can be optimized a little bit more, then please feel free to comment on this. Recently, I received a tweet from Mikael Nyström aka The Deployment Bunny about a TechNet article which states that you can reduce your Windows 8.1 or Windows Server 2012 R2 image size by redefining your ‘base’ image through cleaning up your WinSxS folder. Thanks for that Mikael, this gives me something to look into for various scenarios. When installing updates, either online or offline, all old files which are being replaced by the update are stored in the WinSxs folder to allow yourself to initiate a rollback by uninstalling the update(s) selected in case you need to do so. A major downside is that if a lot of updates are installed this folder can become particularly large. This applies to a Windows installation on a computer and to a somewhat lesser extent the size of your Windows image. So, I decided to put the article to a small test and see if I can get a result from this. 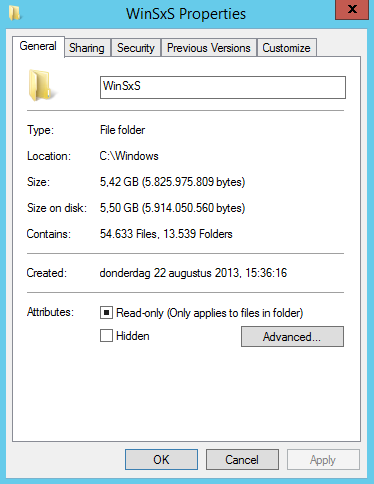 When installation is finished I check the amount of space used by the WinSxS Folder. The number of updates is quite low (ten-ish) so no huge numbers of GB used. Then I checked the amount of disk space used again. Hmmm, that’s nice. Roughly 1.4 GB of space freed. Although the number is not so dramatic in this example, I can image this can increase when the number of updates is much bigger. Keep in mind though, that you can no longer uninstall any updates installed. You need to make sure your process and workflow suit the requirements of company policy. 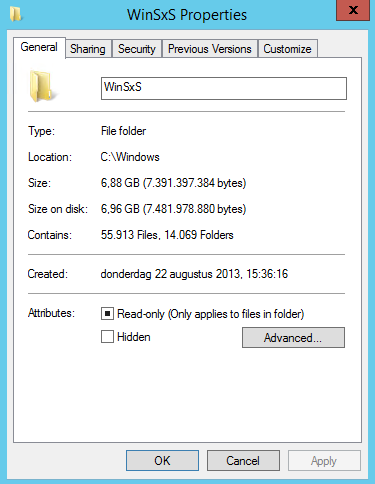 Of course, quite a number of options are available to use this method to reduce the space used by the WinSxS folder. Too bad this ridiculously easy way works with Windows 8.1 and Windows Server 2012 R2 only. In general, thin clients are equipped with very small disks. Your image file should be as small as possible but should fit to your needs. Using ConfigMgr OSD capabilities allow you to deploy an Operating System to the device. Since space is very limited, you might get in trouble when running a Task Sequence. Out of the box, when all content is created using the default settings, all content must will be downloaded to the device and run locally. It’s the only option you have when you create the deployment for your Task Sequence. The static nature makes it very suitable to use Packages instead of Applications. This allows you to run everything from the Distribution Point instead of downloading them. In order to make each package accessible from the DP, you need to modify the following setting at each package. Enabling the selected check box will create a folder in the SMSPKGX$ (where X is the drive letter of your disk used) once distributed. Once done, an additional setting is available in your deployment. As you may notice, this is nothing new. This is standard configuration ConfigMgr 2012 offers you. However, you may need to do this if space is a limitation. Of course you can use this method for other deployments than thin clients only. Using this method has some advantages and disadvantages. Recently, a customer had a rather annoying issue when attempting to build a master machine for his VDI environment. The customer deploys their VDI infrastructure on a VMware platform. Windows 7 is used as a client OS. Since my knowledge regarding VMware is rather limited, I was told it’s a VMware best practice (I prefer to use the word ‘recommended’ instead of ‘best’) to equip the VM with a vmxnet3 adapter. ConfigMgr 2012 SP1 is used to deploy Operating Systems for everything, all site servers are running Windows Server 2008 R2 SP1. Next to VDI, fat clients and thin clients are deployed with ConfigMgr 2012 SP1. For the VDI machine using a vmxnet3 NIC, the deployment fails loading the boot image into the RAM drive. I receiver error 0xc0000001 which states: A required device isn’t connected or can’t be accessed. Knowing that I have scenarios which are successful all the time, the only thing I could come up with is network related. I focused my troubleshooting on the networking part. One important question here is: In what way is the vmxnet3 driver behaving differently to other NICs? After restarting the WDS and SMS_EXECUTIVE services, we tried again. We noticed the number of failures dropped significantly. Although the success rate is not 100%, it became much better than before the modification. Recently, Microsoft was very nice to provide a webpage with all available Powershell cmdlets for the System Center Suite. Fellow Dutchman and MVP James van den Berg made me aware (Thanks for that James J). To play around with Powershell, I’ve decided to use the scenario of my previous Case Study post regarding collections and deployment. For this blogpost, the application used is already imported and distributed to a DP (this is something for another post to create/manage possible workflows). Add-CMUserCollectionIncludeMembershipRule -CollectionName “Uninstall Adobe Reader XI” -IncludeCollectionName “All Users” did it for me. Well, it’s almost the same as step 4. It’s good to see the cmdlets are very straightforward. I have to admit the example used is very static. I need to familiarize myself more how to dynamically populate items such as security group names. Once I achieve this, I can take it to the next step to add more automation to this workflow (maybe with Orchestrator). I need to find ways to achieve this but I feel confident in doing so. Suggestions are very welcome, so please post your feedback on this. I also have to admit that I really love this approach, it really allows me to translate a workflow into a technical solution. I am certain I’m going to investigate more time using Powershell with ConfigMgr. Recently, at one of my customer’s ConfigMgr site, I was asked to look into an issue regarding application deployment. While the philosophy and its approach make sense, the customer was confronted with uninstall actions executed at users even though the user was a member of the security group. I learned that hundreds of applications were deployed in this fashion and the behavior wasn’t happening all the time. I can imagine that a ConfigMgr client has to process too many rules that will cause some uninstall rules to slip through and take precedence. I created a standard .msi application (all defaults) for Adobe Reader. This is expected, only one user has the application installed. Well, let’s have a look at the Status. It is interesting to see the install deployment wins over the uninstall deployment for DOMAIN1\Richie. With my current collection queries, I can’t achieve this goal. I need users instead of user groups. I need to create a new query that will target users instead of user groups to achieve my goal. NOTE: Initially I tried the same query and added a ‘not’ operand but that doesn’t work. If a user is member of more than one group, then they will meet the query. Eventually I got all users in the collection. I was forced to use the rules displayed above to meet my goal. Feel free to try this out yourself, make sure that you got your collections right by making sure the objects that meet the query are the ones you expect before deploying anything.